This system is ideally suited to high rise properties, tower blocks, blocks of flats, halls of residences, office blocks. 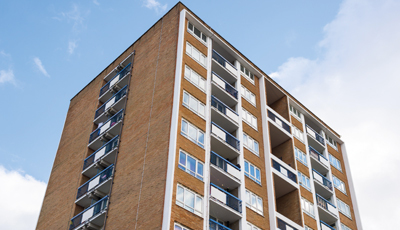 The tragic results of the Grenfell Fire disaster have illustrated the need for dry risers in all high rise properties and it may soon be law for sprinklers and mist systems to be installed in new builds and retro fitted to existing buildings. The presence of a dry riser in a tower block would mean that fire fighters would not have to drag charged hoses up through the building to fight a fire they can simply connect to a water supply on whatever floor they need to. This speeds up the firefighting effort and reduces the health and safety hazard of hoses blocking evacuation. A dry riser is a normally empty pipe that can be externally connected to a pressurized water source by firefighters from their fire engine. It is a vertical pipe intended to distribute water to multiple levels of a building or structure as a component of the fire suppression systems. Dry risers ensure that fire fighters can use a central source of pipework to access water at any level in a tower block. They can connect their hoses simply without having to drag water charged hoses through the building thus speeding the fire fighting effort and reducing the risk to residents.